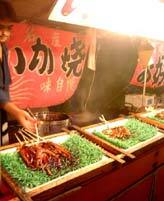 Just as other countries have street stalls, we also have various kinds of street stalls in Japan. 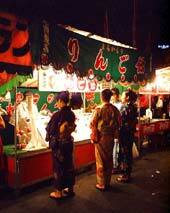 Street stall ("yatai (food stalls)" in Japanese) are mobile stalls which sell various foods and drink. Street stalls are usually to be seen clustered around parks, stations or fairgrounds. 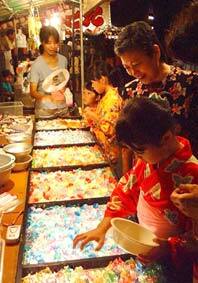 Japanese typical food stalls are Ramen noodle, oden, yakitori, dango (rice cake), sweet potato, frankfurters, takoyaki, etc. They usually open in the night. "Irasshai!!" When you open the curtain of yatai, the yatai's master will welcome you with a lively voice. Yatai has warm atmosphere in a small space. People are sitting tightly on wooden long benches in a cozy yatai and the master is cooking and serving in the middle. There are sounds of people's talk, laughing, sounds of cooking, boiling. Yatai makes a special atmosphere. When you sit in yatai, you feel at home and it is easy to talk with strangers there. Yatai is the place where you can feel the local atmosphere. Recently, circumstances of food stalls are changing in big cities. Food stalls appear around the office buildings during the lunch time. They sell and deliver lunch to office people. Food from the street stalls are cheaper than a normal restaurant, convenient, save time, and are fresh. There are various food stalls like Japanese style lunch box (o-bento), sandwich, curry, Asian food, coffee, etc. They are like traveling restaurants. Food stalls are now trendy as a new style of food business in Japan. Many street stalls are also seen at festivals. Especially Summer festival season like now, many street stalls sell food, drinks, toy, and hold games. 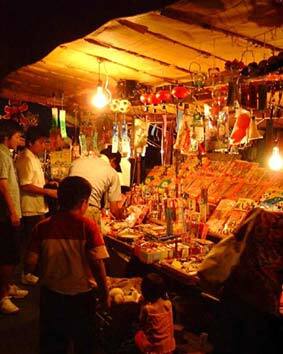 Street stalls sell things or hold games called "yomise (night shop)". Festivals without street stalls are not festivals. Those street stalls make the festival active, and attract people. Around street stalls, many people gather... families, couples, girls in yukata (cotton kimono), children....playing games, buying foods... Everybody around street stalls looks happy. Yatai is just a small booth, but it is full of tasty and fun things to make people happy. Here, we introduce some typical foods and games which can be seen in Festival street stalls. Let's go out to the Summer festivals and check out Japanese street stalls. It is said that the first street stalls appeared in the 18th century in Japan. In the big cities like Edo (Tokyo), Kyoto and Osaka, Sushi and tempula restaurants put tables with rooves outside in front of their restaurants and sold sushi and tempura. It is believed to be the beginning of yatai. Yatai was not a mobile street stall in the beginning. Later, they put wheels on the tables to be able to move them to the busy places. Yatai was like fast food shops at that time. In the Meiji period, sake was sold at yatai. And oden and broiled squid were also sold as a side snack. And now, ramen noodle is the top yatai food. Fukuoka is famous for ramen yatai! Speaking of drink of street stalls (in Festival), most Japanese would think of lamune. Lamune is soda water which is usually sold in thick clear glass made bottle. The uniquely shaped bottle of lamune hasn't changed from olden times. Lamune was sold only in festival places. When I go to the festival, almost every time I buy a lamune. It is a very dear drink of Summer. When we buy a lamune, the shop person opens the lid in front of you. In the mouth of the bottle, a small glass ball is stuck. If you push down the ball, you can drink it. When you drink it, the ball moves inside the bottle and makes a nice sound. "kara kara....." If you just drink without thinking, you will realize sometimes the ball closes the mouth of the bottle and you are not able to drink! I'll tell you a knack. If you see the bottle, you will find a hollow on the top of one side. You drink this side facing down, the ball stops at the hollow and you can easily drink it. It is a very unique drink. Recently, lamune has been sold at some convenience stores, but I think drinking lamune at street stalls is the most delicious way!! It is candy apple which is a whole red apple on a chopstick and coated with candy. Those red and sometimes blue apple candies are stabbed on the table at the street stalls. There are several sizes. Its lustrous candy and gorgeous color always fascinates girls. Sweet, sour and juicy, apple inside a sweet candy. Girls in yukata (cotton kimono) holding a red apple candy look cute and are a good subject for a photo model. However, eating the apply candy is a different story. Candy is quite hard to eat! In the beginning, you enjoy tasting candy. But after for a while, you realize how far it is to reach the apple. You lick it and later try to bite it... but, it's tough. Hands holding candy become sticky and sometimes the apple falls down before you taste it. You need to be eager to eat a candy apple. Speaking of Summer's sweet, it is Kaki-gouri (shaved ice)!! Humid and hot Japanese Summer make us to want to eat cool shaved ice. Shaved ice stalls are the most popular after the soda stalls. Shaved ices are served like a mountain in a cup, and syrup is put on top. There are various flavor syrups. strawberry, melon, blue hawaii, coffee, milk, orange... Popular flavors are milk syrup, strawberry and uji (green-tea). Did you know that there is typical shaved ice in Kagoshima? It's called "shirokuma (literally, white bear)". It is shaved ice with milk syrup and fruits. Try it! Tako-yaki, Ika-yaki (squid), Okonomi-yaki, Yaki-soba. These are popular food stalls which you can always find. Prices are almost the same, but the taste is different in each shop. Look around and find a shop which looks clean, busy and active. This is one of the most popular street stalls now and in the olden days. You can't have street stalls without this stall. This is a game to catch goldfish in water. In the low table filled with water, many colorful small goldfish are swimming smoothly. Around the table, children, girls or couples are usually sitting. Everybody give an eager look to goldfish. It costs about 200 ~ 300 yen for one game. When you pay, you receive a scoop. There are 2 types of scoops; one is thin paper and other is made of ice cream cone wafer They are very fragile in water. Therefore the game is quite difficult. When you find your goldfish, let yourself holding the scoop in your right hand and ball in your left. And chase your goldfish, and try to catch it!!! You will be required to have instant speed. Try not to put the scoop in water as much as possible, and dip up a goldfish instantly. It sounds easy, but it is difficult. Most people let goldfish go by tearing the scoop, when they try dip up. If you take 1 or 2 goldfish, that's great! Even if you miss goldfish, the shop usually gives you 1 or 2 goldfish. So... enjoy dipping goldfish! 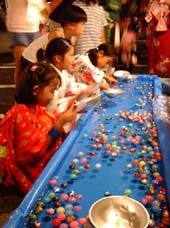 You will see many people bouncing small ball while walking around the festival. The ball is called "yo-yo-" or "Bon-bon" which is a rubber balloon filled with air and water. This balloon catching street stalls are one of the popular stalls. Inside the long low table filled with water, colorful balloons are floating. This is the game where you take the balloon with a hook made of paper from the water. You find a your favorite color and design's balloon. You move your favorite one in front of you, and try hook it and pull up. This is also difficult to pull up. Even you didn't take any, they will give you one. If you get your balloon, put the rubber on your finger and bounce it!!! Speaking of Japanese Summer, we think of Fireworks! You can't talk about Summer festival without fireworks. Japan is the fireworks country. We are the top level fireworks producing country in the world. Our fireworks are famous for variety, beauty and size and history. Huge dynamic fireworks displayed in festivals are gorgeous, but handy small fireworks are also nice. At the hanabi street stalls, colorful and various kinds of fireworks are displayed. Handy fireworks, rotating fireworks, skyrockets, unique fireworks...etc. Among them, the most popular and beautiful fireworks is senko-hanabi (toy fireworks). About 20 cm length fireworks twisted by colorful Japanese paper. It is small and thin. You will doubtless to see it "Is it the most popular hanabi?". When you light the end of hanabi, it starts sparkling. pachi..pachi... small and big orange colored sparks fascinate everybody's heart. It so beautiful and peaceful. This is the Japanese hanabi. When you find fireworks stalls, buy "senko-hanabi". Please find a quiet and dark place, light the hanabi and enjoy this peaceful firework. Enjoy Japanese Summer Night!! 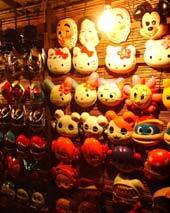 Various masks of animation characters are displayed from bottom to the top of the street stalls. Those colorful masks always fascinate children. The street stalls of masks have been seen from olden times. You can see the generation of popular animation characters of the time at the stalls. That's is interesting. It definitely adapting to the wave of the times.